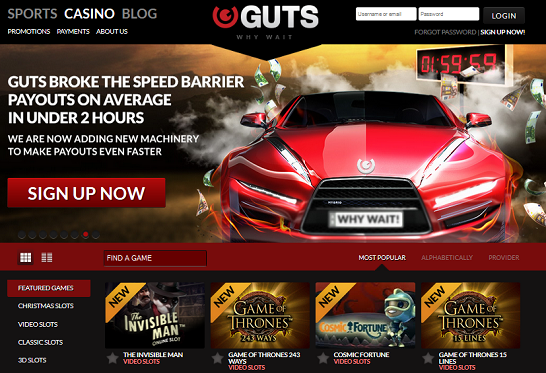 Guts casino can be considered a relatively new gambling site, launched in May 2013. Guts casino joins a group of new, edgy, multi-software instant play casinos, such as Mr Green for example. It offers great variety of games from five different developers, such as Microgaming, Net Entertainment and BetSoft. The website’s management team is based in Malta and works at Guts Gaming Limited. The casino is just one of the two sections that are available at Guts.com, the second one being the sports book. In our review we will focus only on the casino part. Restricted Countries: USA, Belgium, France, Spain, South Africa, Portugal. Click here for USA online casinos. Claim your $/€/£ 300 Bonus and 100 Spins at Guts Casino*The welcome bonus is for new customers only. Min: $/€/£ 10. Max: $/€/£ 100. Wagering: x35, must be completed withing 30 days. Skrill/Neteller/Paysafe excluded. Game weighting and terms apply. The casino’s design is very slick and edgy, but it has a dark appearance, which is not that easy on the eyes. Despite that, it does look good and when you add the red accents that are visible everywhere, you get a site that you enjoy spending time on. 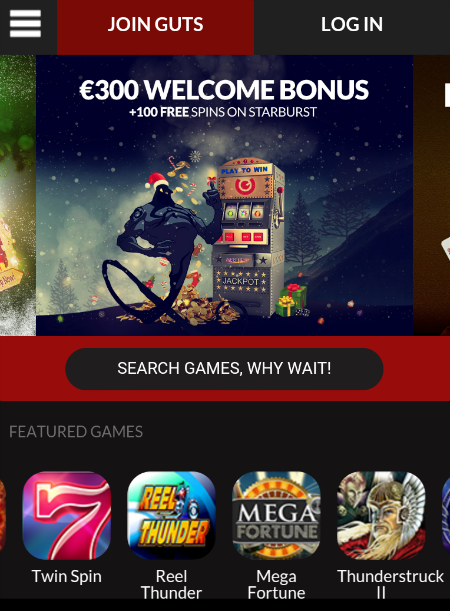 Guts casino is available only in instant play mode (no download version), but unlike many online casinos which struggle with the instant play mode, this one is close to perfect. The games load fast; it’s easy to navigate on the site and the whole experience is very smooth and friendly. As far as games go, instead of going with a single developer, Guts integrated games from multiple providers using the EveryMatrix software. What I like specifically about their portoflio is that the nice combination of old-timer providers such as Microgaming and IGT, with some relatively new names, such as Betsoft. Other names include Net Entertainment, Leander Gaming, 2 By 2 and OMI Gaming. I won’t start listing all the games, since there are over 700 of them, including 500+ slot machines. There are plenty classic 3 reel slots, 5 reel video slots, great line of edgy 3D slots by BetSoft and NetEnt. Great variety of progressive and Mega progressive slots, including The Dark Night, Mega Fortune Mega and Arabian Nights. All sit well above the $1,000,000 mark. Other games include Blackjack, Roulette, Craps, Video Poker, Baccarat and Live Casino tables. If you’re almost convinced, and you’d like to know what kind of advantages you would get if you signed-up right now, check out this welcome package that Guts Casino has in store for you. It combines both cash bonuses for your initial three deposits and extra spins to be played on the Starburst slot machine. It starts with the initial deposit of up to $/€/£ 100, for which you get a 100% match bonus plus spins on Starburst slot. Next, you get a 50% bonus on your second deposit, worth up to $/€/£ 50 and additional spins. The third part is a 25% bonus with a limit of $/€/£ 50 plus 25 spins. Last, you get a whooping 200% bonus and spins. Overall, the casino will give you $300 in cash and 100 extra spins, if you decide to give them a chance. The wagering requirements are x35 the bonus amount, which is better than industry’s average of X20 (b+d) and the bonus is cashable! Please note that during the bonus, the maximum bet per spin is €7.50 (75kr, $7.50, £6). Guts Casino has a solid variety of banking methods. The best part is the instant withdrawals for e-wallets and unlimited withdrawals (through specific methods). The minimum deposit + withdrawal is $/€/£ 20. E-wallet withdrawals are processed instantaneously, while credit card and wire transfers are processed within 24-72 hours. The maximum withdrawal limit varies according to the method: €2,000 per Visa transaction, €10,000 for Skrill and if unlimited if you choose to withdraw via Bank transfer. There is a small fee of €2.5. As far as security goes, you will find that from the first time you load their website you’re protected by SSL encryption at 128 bit, obtained through Comodo. Malta’s Gaming Authority and Great Britain’s Gambling Commission guarantee you that your rights are being protected. Guts has a clear history in terms of player complaints and was chosen as the Best New Casino of 2013 by CasinoMeister. Unlike many online casino that had to adjust for mobile, Guts casino was built with mobile in mind. The casino is extremely easy to use, even on smaller displays of Iphone. The variety of mobile slots and other casino games is endless. Available on all mobile devices and tablets. One of the best mobile casinos out there. You have some very good reasons to give Guts Casino a try. Since they launch, they seem to be doing everything right to keep their players happy and entertained. Amazing variety of games, nice welcome bonus and various weekly extra spins, instant withdrawals – that’s good enough for me.